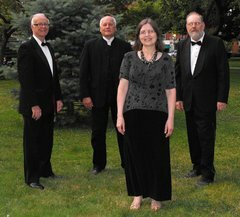 The Four Grads will present "The Musical Odyssey of the Great American Songbook," with a lecture and live performance on Tues. evening, July 22, 7:00 p.m. at the Jefferson Educational Society, 3207 State St. in Erie. Call 814/459-8000 for additional information. Four Grads members are Carl Hultman - vocals/guitar, Stan Bialomizy - vocals/saxophones, Barbara Schwartz - vocals/banjo & percussion, and Bob Seaman - vocals/acoustic bass. The group is influenced by the harmonies and style of the Four Freshmen, and features both FourFreshmen and original arrangements. The program will include music of the Four Freshmen, the Beatles, Manhatten Transfer, and the Beach Boys. Contributions from country and bluegrass be included in selections to be performed and discussed. The Four Grads was born in Erie in 2012. Organized by Dr. Carl Hultman, the group has performed to enthusiastic audiences in a variety of venues in the Erie area. A sample of their work at the Anchor In earlier this year.